"This text is the most prominent landmark in the field since May, Angel and Ellenberger’s 1958 classic, Existence. 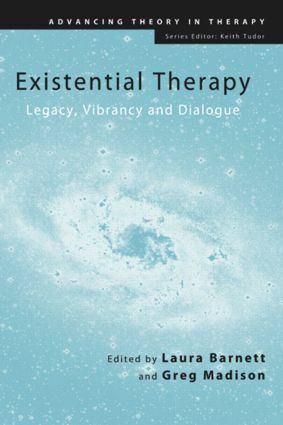 When reading the chapters of these prominent existential therapists and thinkers, you rediscover the unique value of the existential contribution to the field of therapy and the urgency of this approach for our present situation as human beings." - Bo Jacobsen, University of Copenhagen, and author of Invitation to Existential Psychology. Barnett, Madison, Introduction. Craig, Existential Psychotherapy, Discipline and Démarche: Remembering Essential Horizons. Frie, Existential Psychotherapy and Post-Cartesian Psychoanalysis: Historical Perspectives and Confluence. Holzhey-Kunz, Fazekas, Daseinsanalysis: A Dialogue. Barnett, Tedium, Ennui, and Atonement, Existential Perspectives on Boredom. Todres, Gendlin, Experiential-Existential Therapy: Embodying Freedom and Vulnerability. Madison, Gendlin, Palpable Existentialism: An Interview with Eugene Gendlin. Cannon, Applied Existential Psychotherapy: An Experiential Psychodynamic Approach. Heaton, Thompson, R.D. Laing Revisited: A Dialogue on his Contribution to Authenticity and the Sceptic Tradition. Hoeller, The Existential 'Therapy' of Thomas Szasz: Existential, Yes; Therapy, No. Spinelli, Cooper, A Dialogue on Dialogue. Längle, The Viennese School of Existential Analysis, the Search for Meaning and Affirmation of Life. van Deurzen, Reasons for Living: Existential Therapy and Spirituality. Finlay, Research: An Existential Predicament for our Profession? Schneider, du Plock, Depth and the Marketplace: Psychology's Faustian Plight, a Dialogue. Friedman, Carel, Hassan, Orange, On Reading Irvin Yalom's Staring at the Sun: Overcoming the Dread of Death. Barnett, Madison, Conclusion.